The girls have been building up fast this spring, and as mentioned in my last two posts, we experienced two swarms in one weekend. Both were retrieved and rehived – one is happily rehomed in Green Hive, and the other in Blue Hive. However, the Blue Hive swarm left the hive (absconded) within a day. That left Blue Hive empty again. I had planned to inspect the hives that same weekend to give them space and check their food, but with all the excitement, I had to postpone the inspections until they settled down. I took a half day from work several days later, when the weather was sunshiny and perfect. I could take my time and perform a proper inspection. Preparation is important prior to inspecting. I had extra boxes, drawn frames, undrawn frames, honey frames (covered so as not to encourage robbing), fume board, tools, and smoker. You never know what you’ll find in these hives, so it’s good to bee prepared for any scenario. I’m much better about taking my time now, one hive at a time. They say “get in, do your business, and get out”. I follow this to an extent, but I’m also very careful to process what I find as I go, and make smart quick decisions that are most beneficial to the bees without rocking their world. Purple Hive was filled with bees, honey and brood. They looked great and I was really hoping to find some queen cells so I could make an easy split for Blue Hive. I don’t need a queen cell to make a split. As long as they have good frames of eggs and larvae, they’ll figure it out themselves. But considering it takes ~3 weeks for them to make a new queen from scratch, then factor in the time for mating and laying, its much faster and less risky to just give them an nice fat ready-made queen cell. I didn’t find any queen cells in Purple Hive, which indicates that they likely did NOT swarm. I set up a new box of checker boarded frames (honey on ends, and alternate drawn and undrawn frames in the center) and added it just above the bottom box to directly expand the brood chamber and give the queen plenty of room to lay and the other bees plenty of room to spread out. I put “Humpty” back together again and move on to Mint Hive. Mint Hive, my active and temperamental Texas bees, had swarmed on Sunday and upon removing the inner cover, it was evident that their numbers had reduced, shown below. I used the fume board to clear out and remove the top box. The other boxes were full of bees, honey, brood, and lots of queen cells. I snagged a frame w/ a gorgeous fat queen cell and transferred it to Blue Hive, along with some good honey and brood frames, and plenty of bees. A feeder was added and Blue Hive was back in business. I’m happy to report that they’re building up well and everyone seems healthy and happy. Yellow Hive was much the same as Purple Hive. Lots of bees (shown below), but no signs of swarming. I gave them the same treatment, adding another checkerboard box above the bottom box, and letting them grow and prosper. A few weeks later….Supers are on!!! Within a week after the inspections, I added the supers. Wisteria is starting to bloom, dandelions are out, the nectar flow is on! We don’t want to miss a beat. Plus, the supers give them more space…always a good thing this time of year. Of course, as soon as the supers are added to Purple, Mint and Yellow hives, Mother nature drops the temperatures about 20 degrees and rains on our parade, for a week and a half straight! Ugh. The girls jump at every opportunity to get out of the hives and forage. Purple Hive is bursting, so I’ll split them at my soonest opportunity. I need to find more space to put nucs and possibly more hives. The hubster will be thrilled…not. Green and Blue hives are developing nicely. I’m keeping them fed. The garden is bursting and soon we’ll bee planting our veggies. Spring is already flying by fast! With the cold and wet weather extending into April, the bees have been cooped up longer than usual, which makes for a slow start in terms of building up their populations and gaining access to pollen and nectar sources. Providing clean frames in the box above the queen so she’ll have lots of space to lay many more eggs and move about freely. Purple Hive – small amount of brood, no eggs or larvae, lots of honey frames. 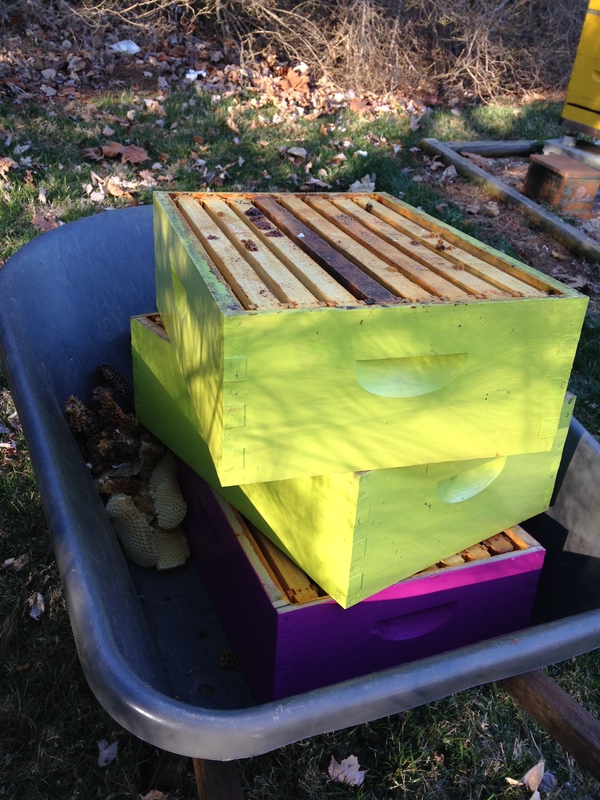 Green Hive – No brood, no larvae, lots of empty comb, and lots of honey frames. 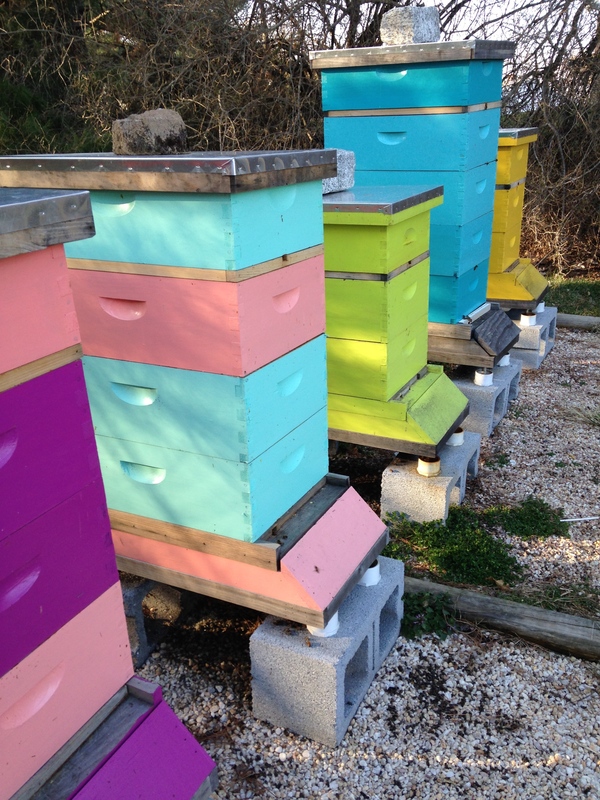 Blue Hive – No brood, no larvae, lots of empty comb, and lots of honey frames. Based on this inspection, only Mint Hive appeared to have an active queen, so this past week I was sent searching across the US for three queens. I quickly learned that queen bees aren’t typically available til about the 3rd week of April, and most of those were spoken for, which meant no queens for the BooBees until well into May. Ugh. It doesn’t take long for a queenless hive to deteriorate, and here I had three suspected queenless hives. So what’s a beekeeper to do with queenless hives and no queens? The weather has been improving with each day, and this past weekend was gorgeous. Flowers and trees started popping from out of nowhere, and the girls were buzzing with happiness over our cherry blossoms. Seems good weather was exactly what the bee doctor ordered. I dug back into the hives and discovered good brood, larvae and eggs in all hives. A festivus miracle, indeed! And they saved me $75! The hubster laughs because 2 years ago I would’ve been Chicken Little screaming “the hives are falling, the hives are falling!”. While inspecting, I pulled the jars of syrup. The bees have enough honey, they weren’t taking the syrup, so best to let them eat their natural food and save me the time and headache of dealing with supplemental feeding. They’re big bees now and able to feed themselves, so next week we’ll pull out the supers and give them space to start storing honey…for them and for us! Lastly, during our spring cleaning and reorganizing, I collected old frames with dark wax comb that can be cleaned out and replaced with fresh wax foundation. Old comb is not healthy for the bees, so I’ll melt down and process the wax to use in balms and soaps. It’s tedious work, but I love the end product! Strategies for the season ahead? The hubster said I have room for 3 more hives…and that’s in addition to reviving yellow hive – so who knows, I could have eight or nine hives by the end of this season. We shall see! In anycase, the girls are now ready for spring. Yay!